The Cellab® Bioreactor System with scaffold holders represents a highly flexible and efficient bioreactor configuration for tissue engineering using up to 5 individual scaffolds. The scaffold consists of a porous biocompatible material that provides a three-dimensional support for initial cell attachment and subsequent tissue formation. 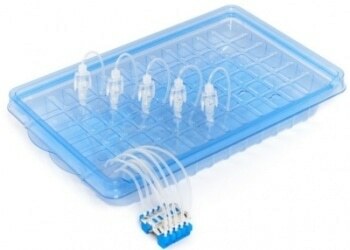 Each scaffold holder is integrated in a Cellab® Disposable Set and operated by a Cellab® Docking Station guaranteeing a sufficient supply and distribution of nutrients and oxygen through the porous scaffold and into the cells. The docking station allows for automated medium supply via flow perfusion.